Say Bacon!! 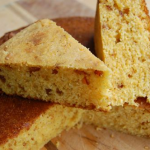 Yea, This cracklin corn bread recipe is as good as it gets. Corn bread is good enough but bacon, bacon, bacon, makes it the best. Note: You can change the number of people served by placing your cursor over "Servings". The Ingredients will adjust to the new number of servings. Saute chopped bacon in large heavy skillet over medium high heat until brown and crisp. Using slotted spoon, transfer bacon to paper towels. Reserve 6 tablespoons drippings from skillet. Brush 10-inch diameter ovenproof skillet with 2 tablespoons reserved drippings. Place skillet in oven to heat. Whisk corn meal, salt, baking soda and baking powder in medium bowl to blend. Add buttermilk, egg and remaining 4 tablespoons reserved drippings. Whisk until just blended; mix in sauteed bacon. Pour batter into hot skillet. Bake corn bread until firm to touch and golden, about 25 minutes. Turn cornbread out onto rack and cool. Corn bread can be prepared 1 day ahead. Wrap in foil, store at room temperature.